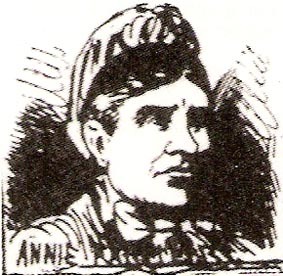 The forty-year-old wife of a City Road tradesman, Annie Farmer left her husband and slowly reverted back to a life as an unfortunate in the streets of Spitalfields. She went by a variety of nicknames; 'Flossie', 'Tilly', 'Dark Sarah' and 'Laughing Liz'. On the morning of November 21, 1888 (the day after Mary Kelly's burial), Farmer picked up a man of "shabby genteel" in a suit at 7:30 AM and returned with him to Satchell's Lodging House, 19 George Street, Spitalfields. He paid for a bed for both of them. Two hours later, Annie screamed loudly, and only moments later the man flew out of the doss-house along George Street and into Thrawl Street. As he passed two cokemen he exclaimed, "What a -- cow!" He then disappeared. Annie seemed quite distraught, and claimed she was attacked by Jack the Ripper, as her throat was lightly cut and bleeding. The crowds of George Street once again thought the Ripper had struck and gone free, and it wouldn't be long before panic overtook reason. The police, however, were skeptical of her claims, as her injury was quite superficial and done with a blunt blade, quite unlike the Ripper's deep wounds with a sharp weapon. And once it was discovered that she was hiding coins in her mouth, it was concluded she had attempted to steal from the man and, once discovered, lightly brushed her own throat with a blunt knife and screamed "Murder!" at her client, accusing him of being Jack the Ripper. The man, understandably frightened due to the very salient possibility of lynching, left as quick as possible. The police called off the investigation and stopped searching for the man, believing he would turn himself in in order to clear his name. This never happened, and Farmer never recanted her original story.